Her One Mistake was leaving her daughter with her best friend, Charlotte. Harriet and Brian have one four-year-old daughter named Alice. As Harriet is a stay-at-home mom, Alice has never been away from Harriet’s side. However, Harriet’s family is struggling to make ends meet. Harriet decides to take a bookkeeping class one Saturday when her husband is fishing. She asks her best, and only, friend Charlotte to watch Alice for the day. Charlotte is planning to take her three kids to the church fair anyway so she is happy to oblige and take Alice too. However, an unthinkable thing happens at the fair and Alice disappears. 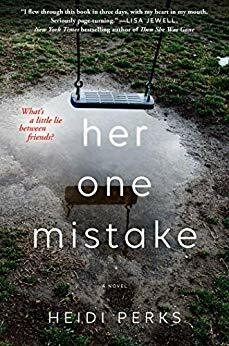 The action and twists don’t stop in Her One Mistake. It is an interesting blend of two types of thrillers but saying which two would spoil one of the excellent surprises in the book. 4 stars! Thanks to Gallery Books for an advance copy in exchange for an honest review.